If you've been following the blog you would have noticed that we've been pushing back the dates for Fixed Roles and Updated Sharing for almost 6 weeks now. This was partly to make sure that everything was working as expected but it was also to allow our developers to implement some other major changes they've been working on. We're now currently testing all the changes and expect them to be implemented over this weekend. Since this is a fairly major update we've been working hard (and continue to do so) to make sure any issues are kept to a minimum. However we will have all of our support staff and developers dedicated to fixing any problems which arise next week. In the worst case scenario we will also have the option to roll-back any changes and postpone the update to a later date. We've updated the calendar in response to feedback we have been receiving. Updated calendar page showing events from personal, staff and course calendars. Display personal, staff and course calendars simultaneously. Add public events which will show up on everyone's calendar. Toggle whether or not completed events are shown. When adding events for prospects / staff you can view the availability for the assigned recruiter /advisor. You will also receive a warning when you try to double book. Assign attendees to meeting events. 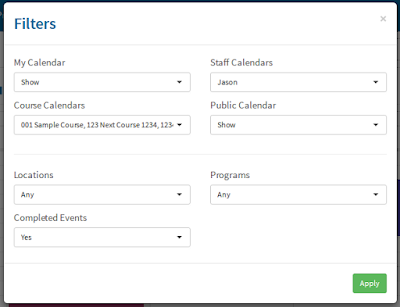 Students now have access to their own calendar which lists event for any courses they are currently enrolled in. Calendar will remember the current view, date and filter selection. Updated to be more consistent with rest of application. 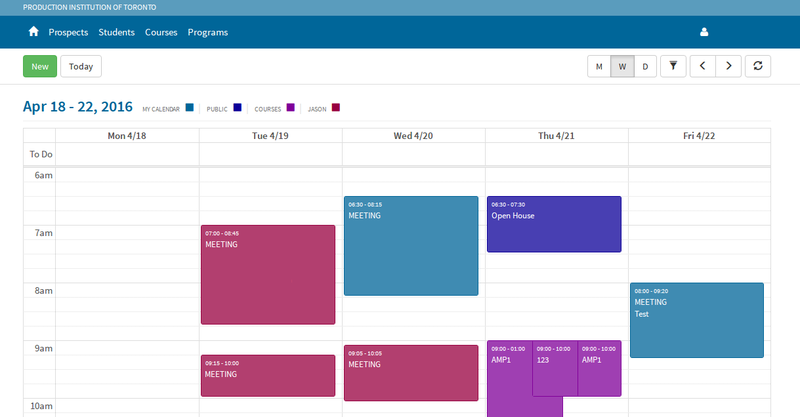 New calendar filters let you choose which calendars are displayed and how they're filtered. All announcements including general, course and program can now be emailed to recipients in a similar way to group emails. The emails are tracked and stats are available on how many users received and viewed the announcement. Announcements now have a 'Display Until' date. They will be seen by users under Home->Announcements until the display date. Announcements can also be 'Pinned'. These announcements will remain in the announcement area until they are unpinned or deleted. Course announcements can now include a document attachment. These documents are available for download when a student views an announcement and can also be downloaded from the course documents section. We've added the ability to create program announcements. These announcement will be seen by students currently enrolled in the program. In addition to newsletters and this blog, users will be notified of any changes, updates or interruption to service through institution announcements. These announcements will be created by ampEducator staff and appear in the regular announcement section. When viewing course or program announcements in the announcement area, users will see the announcement title preceded by the course or program code (e.g. [ABC123] Announcement) in order to help them identify announcements. For a lot of pages when you hit 'Save' the page will no longer need to refresh. The data will be automatically sent and any success / error messages will be displayed. In some areas full page loads have been replaced by modal windows. These are small windows which sit on top of the existing page. This allows you to view / add / edit items without having to load a new page. The institution name has been moved into a separate new bar along the top of the screen.